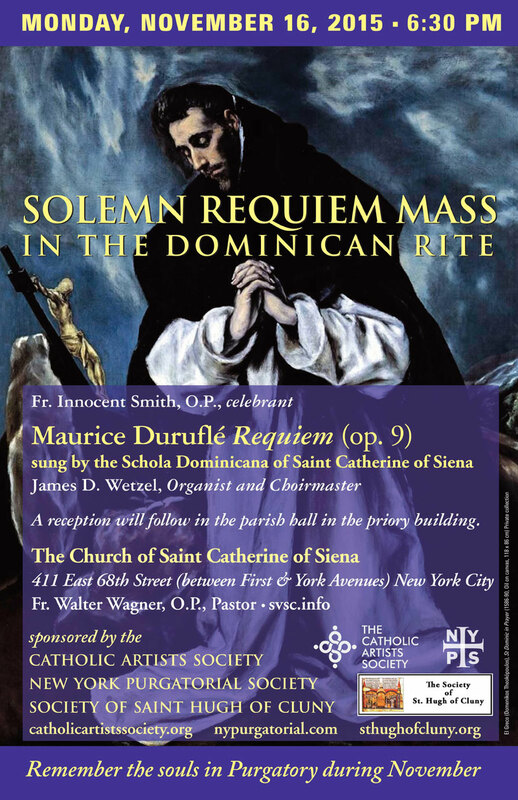 The Church of St. Catherine of Siena in New York is marking the month of the Poor Souls in Purgatory with a Solemn Requiem in the Dominican Rite on Monday, November 16, at 6:30 p.m. The Rev. Innocent Smith, O.P. is the celebrant. Music for the Mass will be provided by the Schola Dominicana of St. Catherine under the direction of Organist and Choirmaster James D. Wetzel; they will perform the Maurice Duruflé setting of the Requiem (Opus 9). A reception follows in the church hall. The Mass is sponsored by the Catholic Artists Society, New York Purgatorial Society, and the St. Hugh of Cluny Society. The church is located at 411 East 68th Street, between York and First Avenues in New York City. The pastor is the Rev. Walter Wagner, O.P.